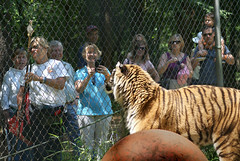 Did you know your Membership with Carolina Tiger Rescue is your ticket to more than a visit with the cats? We make you a partner in our efforts to save and protect wildcats in captivity and in the wild. Your membership strengthens your connection to Carolina Tiger by providing access to Carolina Tiger Rescue “family” emails, members-only emails, and members-only events. Best of all, when you join Carolina Tiger Rescue, your annual membership dues provide valuable financial support for the magnificent tigers, lions, cougars, ocelots, servals, kinkajous, and coatimundis in the sanctuary. ~ Student: available to students. ~ Individual: for 1 named person. ~ Dual: available to 1 named adult and 1 guest. ~ Tribe: includes 1 named adults and up to 3 guests. ~ Tribe Plus: includes 1 named adults and up to 5 guests. FREE unlimited daytime public tours for a full year. 50% off Twilight Tour tickets (ages 18 ). 10% off Specialty Tours like enrichment tours and Feeding with a Keeper tours. 10% off merchandise in the Savanna Station Gift Shop on-line and at the sanctuary. Exclusive Carolina Tiger Rescue Member decal. Early Big Cat Safari Camp registration. Family-only emails about rescues, animal updates, job openings, upcoming events and more. Some of the information is never released to the general public! Invitations to members-only opportunities and events.